How can I improve my tennis game at Merrow LTC? We are committed to helping all members develop their tennis. We have coaching sessions for all ages and levels throughout the week, so whatever your level, our coaches will help you take your game forwards. Meet the coaching team. For beginners, improvers or experts, come and join our group coaching sessions for adults. 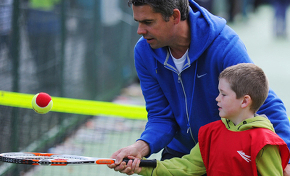 Coaching for an individual or small groups of friends - the quickest way to great tennis.